What is an ahnentafel you may ask? It is a numbering system for your ancestors where you are number one, your dad is two and your mom is three. Every person’s parents are twice his or her number for the dad and the mom is plus one from the dad, so all men are even and women are odd. So I went to Family Tree DNA and used this tool to get the ahnentafel of several unsolved cases of DNA 2nd to 4th cousins for my Dad. Sometimes it worked right away and other times it seemed to want me to select the main person. Perhaps having so many windows open was my issue or forgetting to set the ancestry view. However with a little fiddling I always got the listing and it was quick, once it was happy. It is certainly wonderful to have a list of my potential cousins’ ancestors so I can quickly scan for matching names or places. Not only that, but I can make a list of mine this way and send them along to DNA cousins. Although the common ancestors were not found in those cases I was interested in, having locations gives me some ideas on where to look to further do the genealogy research. One last thought, to automate comparisons you could turn the ahnentafel into a GEDCOM. This program, not free but inexpensive, claims to do that http://biografiasygenealogias.weebly.com/ but I have not tried it. If anyone has used it, I would love to hear from them. To get more than 32 people you have to select more than the default four generations at family tree DNA. This is great! I’ve always had problems trying to navigate through ftDNA trees. The DNArborteum is really useful and I’d not heard of it before! Do turn off your PoP-Up Add Blocker while using DNArborteum, then turn it back on when done. According to the notification from Chrome when the extension is added, DNArboretum can read your browsing history and communicate with cooperating websites. Does anyone know what this is about? I would assume David, that it needs to do that to read the tree information. Thanks Gene, looks interesting. If anyone here tries it, please let me know! Am a real beginner. Does your handy dandy DNArborteum tool work with FamilyTreeDNA? If so, how do you go about it? I have an ahnentafel file and test results from FamilyTreeDNA which have been loaded to gedmatch. Sorry I just do not understand what you are asking. 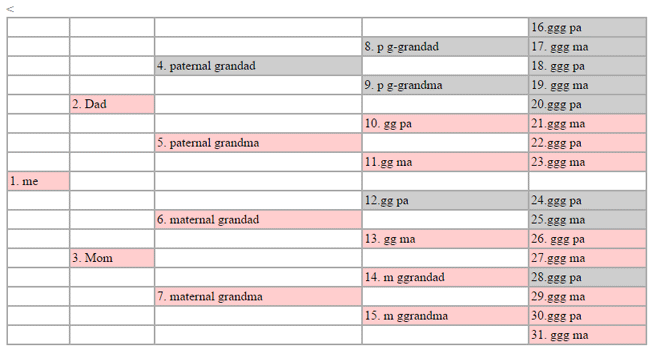 An ahnentafel is a useful condense way to look at a DNA matches ancestor list. 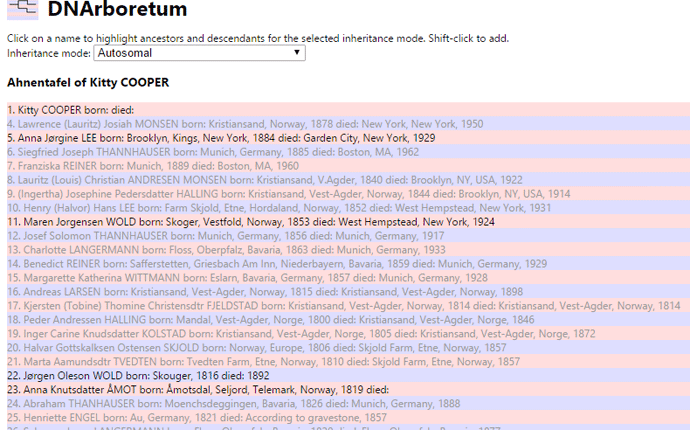 The DNArboretum tool (which I did not write) creates an ahnentafel from the family tree DNA family tree. OK I increased it to 10 minute. If it still fails send me the file. So, it creates a GEDCOM, but only of the last 15 people on my list. Why is it starting with her?